In response to the recent events in Manchester, we want to reinforce and emphasise the importance of vigilance and of reporting any concerns to the anti-terrorist hotline. The current UK threat level for international terrorism is: CRITICAL. This means that a terrorist attack is expected imminently. 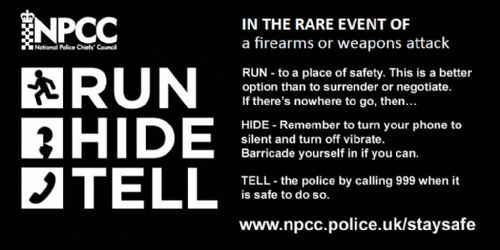 Firearms and weapons attacks are very rare, however having a plan and being conscious of your surroundings when out and about will help you to stay safe and could save your life. The National Police Chief's Council have produced guidelines to follow if you find yourself in a terrorist situation.